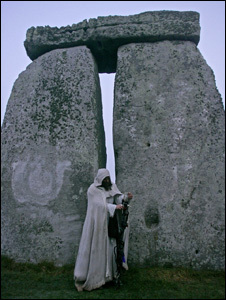 When dealing with prehistory (before the written word) arguments will abound as to ‘who, when and why’, and no more so than the famous monument on Salisbury Plain, the circle of stones known the world over as Stonehenge. 5,000 years ago, give or take a decade, work began here with an initial earth bank and ditch with some form of wooden structure within. Debate continues as to what exactly was placed within the earth circle and further debates are put forward about the various phases of constructing the stone circle, where the stones came from and the importance of the Moon and Sun in the process of worship at the site. 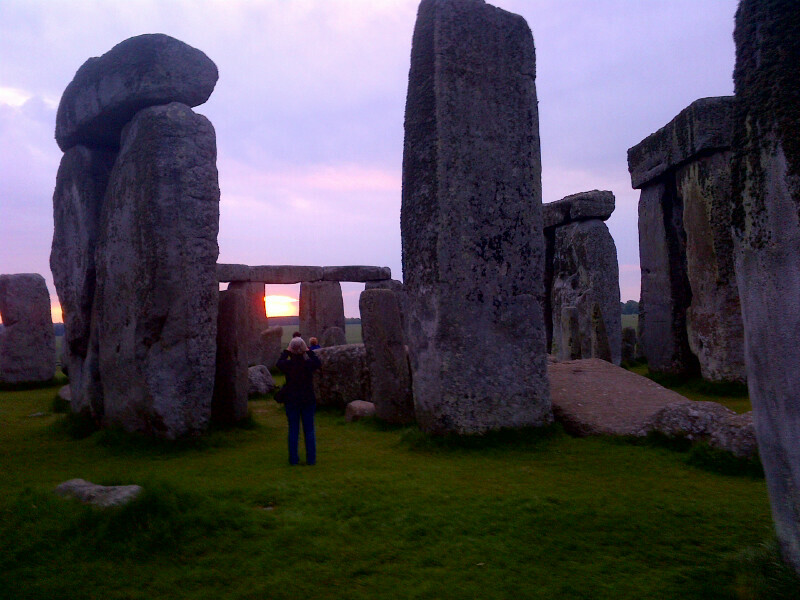 For a lot of day trippers it’s Stonehenge’s iconical status that brings them here in their thousands whether they are familiar with the documentaries churned out by travel channels, read Tess of the D’Urbervilles or have watched National Lampoon’s European Vacation. For the time being visitors will have to make do with very little shelter if the weather proves inclement. Restrooms (including disabled) are available at the foot of the car park and there are others at top of the car park to the right of the entrance, before one walks down the ramp to purchase tickets. These are accessible by going down steps. Before heading down to the ticket booth, two stones are standing to the left. The smaller one is a Bluestone (Dolerite) used in first phase of stone circle building at Stonehenge and possibly from the Preselli Mountains in South Wales. The larger one is a Sarsen (Quartzite Sandstone) used in the later phase of construction. These sample stones are not taken from the circle and you are able to stand next to, touch or drape yourself across them for photographic purposes. Down at the foot of the ramp is the ticket kiosk and a small cafe. Only a somewhat limited collection of outdoor seating is provided, complete with flocks of starlings ready to swoop down on any crumb or morsel dropped by a hungry day tripper. Cheese and bacon scones, rock cakes, ice cream and hot and cold drinks are available. As the site has a captive audience sandwiches are priced higher than the average shop, ditto the plastic cups of grapes or strawberries. The gift shop is only available to those that have paid the entrance fee and entered the site. Here you can purchase calendars, books, paperweights, fridge magnets, T-shirts and all things of a Neolithic nature. A free audio tour for paying visitors is available but during summer weekends they can be hard to get hold of, especially if you find yourself arriving just after a couple of coach loads of day visitors from London sandwiching Stonehenge between a morning at Windsor Castle and an afternoon in Bath. Access to the inner circle is available prior to the main site opening or just after closure. Arrangements for a ‘Special Access’ visit can be made through English Heritage or one of London’s day trip tour companies that pre-book inner circle visits on a daily basis. Other than that regular visitors are kept behind a small rope fence, which helps keep other tourists from walking in front of that all important shot. While circumnavigating the site and listening to the audio tour one may be left wondering how many people visit this site and pay their £6 to get in. 800,000 people, rising to possibly one million by the end of the decade, make the journey to Stonehenge every year boosting the turnover of English Heritage and helping the conservation of other historically important places. One may also be left wondering, what if someone wrote down “today I’m going to build one of the best stone circles in the country” would we still be debating the purpose and timeline of this impressive site?